The process is based on a process of integration of titanium or zirconia to the surrounding bone. This allows the new replacement tooth or teeth to have a very strong and stable base, maintaining the surrounding bone. This is the reason why implants give you the comfort, functionality and beauty of healthy teeth. In order to understand how implants work it is important to appreciate the way in which healing takes place. When a tooth is taken out it leaves a hole in the gum which fills up with a blood clot. Within two months the hole in the jaw is covered with gum, slowly over the next six months the bone fills the hole completely. The healing of implants depends on this natural process. 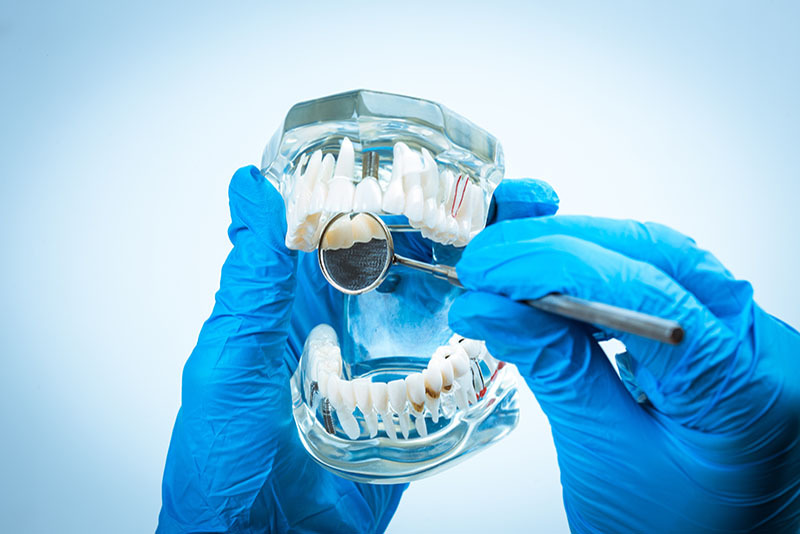 Traditional dentistry, which relies on bridges, partial and complete dentures, simply cannot compare to the "good as new" quality that advanced implant technology can give you. Teeth are rarely lost today, because every effort is made to save them. There are a number of reasons why teeth may need to be taken out. When very little of the tooth remains because of a lot of decay. For example root filled teeth with failed post crowns or broken teeth. The supporting bone around the tooth is lost due to pocketing and infection, in some cases even leading to tooth mobility. Teeth that have been root canal treated can be prone to persistent infection resulting in a poor prognosis and are often removed. Implant therapy is the replacement of the root with an artificial root that is made from titanium or zirconia. The procedure can be used to replace one tooth, several teeth or all the teeth. Your appearance is one reason. Another is that the gap left by a missing tooth can mean greater strain on the teeth at either side. A ‘gap’ also means you ‘bite’ is affected, because the teeth next to the space can lean into the gap and alter the way the upper and lower teeth bite together. This can lead to food getting packed into the gap, which causes decay and gum disease. Implants are a well-established, tried-and-tested treatment. Evidence shows that 95% of modern implants should last for many years with the right care. Yes. You can have any number of teeth replaced with implants-from one single tooth to a complete set. It depends on the condition of the bone in your jaw. We will arrange for a number of special tests to find out the amount of bone still there. If there is not enough bone, it may not be possible to place implants without grafting bone into the area first teeth replaced for many years with the right care. Placing the implants can be done using a simple local anaesthetic. You will not feel any pain at the time, but you may feel some discomfort during the week after the surgery. This is usually due to having stitches, and the normal healing process. You will get pain relief after surgery, which will possibly be continued over the next few days. Take antibiotics, if prescribed. Don’t smoke, exercise or drive for the rest of the day. Don’t rinse the area and only eat soft foods. However, it is important that you keep your mouth clean by brushing-but do not poke the implant site. You can use a mouthwash everyday uring the first week after surgery. The implants need to bond with the bone after they have been put in. This usually takes 3 months in the lower jaw and 6 months in the upper jaw. Sometimes, the implants may be stable enough when they are fitted for the artificial to be attached. If you have complete denture, you will continue wearing these throughout the healing period once they have been modified after the surgery. A healing cap will usually be placed onto the implant site to protect the area during healing. No, but after care is important if you are going to have a long-lasting, successful implant. We will give you detailed advice on how to look after your implants. Cleaning around the teeth attached to the implants is no more difficult that cleaning natural teeth. However, there may be areas that are difficult to reach and you’ll be shown methods to help you. You may need to visit the hygienist more often. Most artificial teeth attached to implants can only be placed and removed by us. However, if you have complete dentures fixed to the implants by bars, then you’ll be able to take them out for cleaning. We will make sure that the implants won’t show during all normal movements of the mouth and lips. You will need to be able to see them, so that you can clean them properly. What if I have an accident after implant treatment? Implants and the teeth they support can be damaged by an accident in the same way the natural teeth can. It is therefore important that you wear a professionally made mouth guard if you play sorts that involve contact or moving objects. If there is damage, the teeth can be dismantled from the implant and replaced. However, if the titanium rod is damaged beyond repair, this part may be safely left in the jaw if it is too difficult to remove. Another implant may be placed alongside it to replace the damaged implant. What are the possible complications of implant treatment? Any surgical procedure carries the possibility of complications. Implant placement carries the very small risk of damage to adjacent structures, such as adjacent teeth (which might be accidentally damaged). When replacing an upper posterior tooth, there are certain risks associated with the sinuses or infection resulting in a fistula which would entail additional treatment to solve the problem. If a local sinus tap is decided upon, there is a possibility that the sinus lining is perforated, in which case we have to abandon the surgical procedure and we won’t be able to place the implant on that day but allow for some healing to occur. The procedure of replacement of the lower teeth might damage the nerve which is passing through the jaw bone, which might lead to numbness temporary or permanent of the lower side of the face extending to the right side of lower lip. There is also a very small risk of infection. Another complication is possibility of significant bleeding after the surgery. We minimize these risks by a very high commitment to careful planning and a meticulous surgical treatment. Research shows that implant treatment gives predictable success in over 95% of cases. Very rarely the implant fails to knit with the bone and we need to start all over again. Generally an implant can be replaced should it fail either at the same time or at a later stage, occasionally additional procedures may be required. There is a low risk of failure of implants after the first years in function as long as your teeth, both general and around the implant is maintained and no excessive forces are exerted. Excessive forces may result in some of the component parts fracturing. You are aware that the implants and teeth are subject to wear and tear, as time goes on. This means that we might need to replace the crown should the need arise. There is a risk of gum recession around the implant. Although this may not effect its survival it might need further treatment for aesthetic reasons.